Traveling to Nepal (or any developing country for that matter) can often be seen in a series of pictures or images that we can look back on and learn from. The pictures can be symbols of need, progress or hope. On my recent return trip to Nepal to review work done by Edge of Seven I also had a series of images that were import in telling a story of the importance of girls’ education in fighting poverty. The first picture is from Salleri, Nepal in the Everest region of Nepal (the Solukhumbu). The White Hills School has about 600 students who attend. Unlike many schools in the area, these students are all attending most days. Whereas many other schools may have 300, 500 or 600 students (total) but a far fewer number attend each day, especially on the days when the visitors AREN’T arriving. This day this month at the White Hills School had the students lined up for their morning assembly of calisthenics, song, and marching off to class. What I find encouraging at the school is the number of girls. This school serves K-12 students, which is rare in Nepal since mandatory education only goes through 10th grade. Here though, 11th and 12th grade (so called “plus2”) are also served and there are a good number of girls who stay at the school all the way through this critical educational milestone. Encouraging. And the school is doing several encouraging things to help girls stay in school. More on this in additional posts. Another snapshot of hope from my time in Nepal was on a winding, narrow road commuting 10 hours to Kathmandu. We passed three different women’s marches — it was International Day of Women — and while each one was small, they were symbolically important. Over the span of a couple hours those three groups that we saw were making a statement loud and clear. Equal opportunity and equal treatment are important to raising families and villages out of poverty. As we sped down the sometimes paved (sometimes not) road at speeds from 80KMH down to 10KMH for the rocks, potholes and washouts, I realized that all over the country small groups of women were marching just like this. And no one was there to see them, hear them, or take pictures. But it amounted to a huge number of women all across Nepal and if you extend this out to Asia and her larger neighbors, it was a groundswell of voices for an issue that is deeply rooted in Education. At the end of our journey we met with the leaders of a small hostel who help girls get an advanced education. The concept is simple. 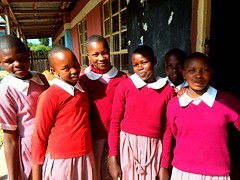 Create a free place for the girls to call home while they get their “plus2” education. Because the distance to the school from their homes is so large (1-3 days hike) the girls HAVE to live somewhere. And this place is free. Girls can then attend school for 11th and 12th grade. Edge of Seven worked with The Small World (a Nepali NGO) to build the school which is now self-sustaining and run by the community. But this snapshot of the girls who run the hostel for 30 girls getting an education that will help them defeat rural poverty is actually a meeting to do a bit more. The girls in the dorm are interested in starting a coop with Edge of Seven support. The training and entrepreneurial skills to launch, run and succeed at this effort are in works for the planning and funding. The coop would include all the girls in a business venture which would continue with each new class that arrives at the hostel each year. Girls would be able to earn money with which they could save, reinvest in their coop, or invest in helping them break down barriers to their education. For example, the girls each take turns walking home (that same 1-3 days) to get food from their families, bringing it back to school so that they have food for the following weeks. Instead of the long hikes, the coop might allow them to purchase food and spend that hiking time on their studies. In each of the snapshots — girls in school, women’s marches, and meetings to build business skills — the hope that we can and will succeed grows. The dedication of organizations such as Edge of Seven, The Small World are yielding results. But more importantly, girls attending school, women marching and launching new teen projects for economic independence is creating higher community ownership and the foundation for large scale change. Peter Mason is the executive director of Edge of Seven which focuses its seven principles on girls’ education through building projects and entrepreneurial programs which create impacts in rural communities of Asia and East Africa. Learn more about Edge of Seven at www.edgeofseven.org. Edge of Seven’s Event auction is open TODAY at http://ow.ly/wlH930f8fW3! While the event is still two weeks away (Fri 9/29) the auction is now open for bids. Even if you can’t make the event, you can bid and win on all these great items (over 100 in total)! JOIN US September 29, 2017: Celebrating Edge of Seven’s Seventh Anniversary. Join us for our annual party celebrating the power of educating girls and women around the world. This year we’re also celebrating Edge of Seven at seven years old — 7 at 7 — and our impacts around the world. Sure, we believe in Community Ownership, but…. Working in the world of International Development I’ve seen a lot of things over the years. If you work in the space you may have as well. For those of you who don’t travel in the same way, think about NGO staff who see a lot of projects around the world. School buildings, water systems, toilets, sanitation, economic development, and on and on. So many projects everywhere in the world. All kinds of interventions. Many of them are no longer functional. They’re broken. They failed. They were never repaired. Maybe they were never used in the first place. Wells with broken pumps. Toilets filled and overflowing never to be used again. Classrooms that fell in during the last earthquake. And on and on. We (collectively) walk past — thousands and thousands (and by some estimates millions) — broken interventions. And inside the space, we talk about how we’re so glad that that “wasn’t us” who put that in. But then again. Perhaps it was us? People move from organization to organization — so maybe it was you. Organizations don’t have visibility to all past interventions — so maybe it was you. Organizations (like their infrastructure) fail — so maybe you were there. Let me correct that. It is us. We are them. We are paying lip service to sustainability of our infrastructure. But why? Why is it that these failures can continue? Some will point at limited funds or limited grant scope. Others will point to a system of funding that focuses too much on a one-year, one-time grant cycle. Others still, just write it off to a law of averages or acceptable rates of failure. I blame our thinking. We are paying lip service to too many of the critical ideas out there and mistaking the emergent outcomes as necessary parts of our “secret recipe.” Have you heard of Sustainability? Local Empowerment? Community Ownership? Yah, you have. And perhaps they’re even embedded in the mission of your own organization, or baked into the buzzwords used in fundraising, marketing and your brand. We are wrong to believe that these items are added to our work. That’s backward. And that’s part of our failure in thinking. One of the cornerstone ideas at play here is Community Ownership. Sure we’re talking a good game. We talk about how we utilize the community, build on needs assessments, focus on leadership and create community-based systems to encourage buy-in. Donors love the idea of community ownership or involvement. But still infrastructure is failing. Maybe not in the first week of deployment, but at some point. Not 100% either, but more than should be failing. The question is, who should be paying attention to the infrastructure over time to ensure that it doesn’t fail? Who is it who maintains, repairs and replaces the water pump, toilet, classroom, dormitory, greenhouse, etc.? Is your organization making a commitment of 100 years to make it work? Probably not. Nor should it. The critical player here is the community itself. Community Ownership. Specifically the community leadership who should “own” — in every sense of the word — the intervention. Likely, we all buy into the concept. We talk a good game. But in the end we’re only playing half the game here. We “believe” that the community should take ownership but we don’t take all the actions to make that property “emerge” from the project. It’s like we’re only playing offense and no defense. Instead of paying lip service to Community Ownership we have to look at our own thinking on the topic and play both halves of the field. Example. Right now Edge of Seven has a project that was completed in 2010 — a school building. Because of the confusion between “community input” and “community ownership” the walls of the building were compromised from the start. The community has now asked our partner for help in maintaining the building. The partner has requested the funds of us. This is OUR FAILURE in our thinking from 2010. If the community was truly empowered, a plan would have been created to maintain the walls of the building which need some on-going maintenance because of the decision to use mud plaster on the earth bag building walls to begin with. Our thinking only comprises part (not whole) of the dilemma. Not only does there need to be a plan, financial consideration, project expertise, human resources, there needs to be a psychological foundation for this “community ownership.” We’re absorbed by all the technical details: is there a mechanic? Do they have tools? Do they have skills? Do they have customers? Do they have a motorbike to get around to customers? Do the customers have the funds to pay the mechanic? And on and on. This thinking is not holistic or systemic. We can therefore easily miss the foundational element of psychology, the human brain, culture and social norms. We must be systems thinkers around Community Ownership to fully understand where we’re screwing it up. To play a good game the space overall has to start thinking systemically about not only that “community ownership is a good thing,” but to actually act in ways that create it as an outcome to belief, intention, and program. Our thinking drives our actions. Based on organizations walking passed failed infrastructure and mentally saying, ‘glad that wasn’t me’ we are all culpable. We are all part of the space that has an empty belief and is not acting to create the environment where “ownership” emerges as a byproduct of the system at work. In other words, we don’t understand that ownership is an outcome of our projects just as health is an outcome of a sanitation project. When organizations begin to see the complex, systemic, values-based, training heavy, local-partner-centric systems AND act on making a better system (see another blog for this one), we will see fewer failures and more Community Ownership will emerge from the projects themselves. Playing a good game on Community Ownership means playing both offense (co-creating projects with community leadership, input and work, support for execution, planning for the future, building systems to fund, maintain, repair and eventually replace) and defense (explicitly working with local partners, CBO’s, NGO’s, community leaders, government players, and other stakeholders to build the psychology of ownership). Playing a good game that is both technical and human, also means understanding the entire system and for that we have to look at our own systems for understanding thinking. How is that we are understanding the system at work? Not just the system of a toilet? Not just understanding education in a rural part of Nepal and therefore how to build a new two-classroom building. Not just understanding how to input money into a situation to build something. We have to play a good game by being good systems thinkers. We have to use the tools of thinking to diagnose, plan, cooperate, fund, and ultimately exit the situation, having left it stronger than we found it. Systems Thinking (in all its various forms) is a powerful tool. (Look for another blog that explains its use in International Development.) But understanding that our failures in the space — and we can see the evidence all around us — should make us stop and take stock of not only what we’re doing well (collectively) but what it will take for us all to succeed so that we are the generation that stops just turning the wheel and begins to get traction to end poverty. There is the temptation at this point to get defensive. Don’t. This isn’t an indictment that we’re failing, but rather to indicate that we are at a crucial moment where we can take our game to the next level. Like a star player (think Jordan) who has an awesome skillset, but who discovers that making everyone else around him better is the way to a championship, we have to do the same. Jordan, early in his career, scored prolifically. But it wasn’t until he made this transition to a player who made all those around him better, that he became a superstar capable of leading a dynasty. That’s where we are today. We (all of us) can make the world a better place by thinking of Community Ownership, not as a bullet point, but rather as an outcome that emerges from a system where all the players have been made better. That star player is thinking. At Edge of Seven we’re not perfect. But that’s the point. None of us are. As NGO leaders we can all improve. The first step is to embrace that simple fact. Far too many failed projects exist in the space. What will we do to reduce the number of failed projects in the years to come? First off, we must embrace Systems Thinking. Determining a common methodology for understanding the world through creating distinctions, understanding relationships, defining systems and using perspectives (https://www.crlab.us/) will assist those of us in the nonprofit space who are focused on Community Ownership. Once we understand that our work YIELDS community ownership and not the other way around, we can begin crafting success stories and fewer failed projects. Our program work is strong, but our thinking is weak. Collectively we can achieve more and we must focus on building systems rather than projects. At Edge of Seven we’ve begun this process by focusing ourselves on not only believing in our principles but living them in the day-to-day work (http://edgeofseven.org/7principles) and in our thinking. This is the first step to building true, genuine knowledge about success in the developing world and the alleviation of poverty. Become a systems thinker. That is the pathway to not only understanding community ownership but creating the conditions under which it will emerge. From that spot, and from understanding that those key things we want (sustainability, community ownership, empowerment, etc.) will emerge FROM our work rather than our work emerging from those things, we can make headway. The canaries are dying all around us — those failed projects all over the world. We can see them every time we travel to Africa or Asia or any location where development has been for 20 years or more. Are we willing to see them for what they are? They are ours. Not theirs. And they’re telling us to wake up, think and get better. Two years ago, a significant earthquake hit Nepal. In the Solukhumbu region homes, schools, outbuildings, and more were damaged or destroyed. And when the second quake hit in May even more damaged buildings became unusable. Even more significant, the human tragedy reverberates today. While we can’t bring back the over 9000 people who were lost, we can support rebuilding in the area. Today we have a special opportunity to create more support through Global Giving — Today only donations are matched 50%. Please help us continue the rebuilding efforts in Nepal. In the last two years Edge of Seven has accomplished so much. After initial responses and aid, Edge of Seven set out with our partner on the ground with dedication, perseverance, and focus on on our mission — girls’ education. Together with your support we built seven temporary buildings and last year alone, three more school buildings. We are building more schools, developing programs for girls to learn about business, and fundraising for communities to replace more classrooms, more toilets, water supplies, and infrastructure that supports poverty alleviation and earthquake resistant buildings. None of this would have been possible without the support of people like you. Edge of Seven continues to rely on donations to help fund our sustainable building projects, education programs, and earthquake recovery efforts. Thank you so much. If you would like to help us to continue supporting people to rebuild their lives in the most isolated regions of Nepal the best way to do it is through a monthly gift. At the time of the earthquake regular gifts allowed us to react immediately and begin our planning for the future. If you are in a position to give on a monthly, yearly or weekly basis please click HERE – it really is the most effective way to support Edge of Seven. Thank you for your ongoing generosity and friendship — you have helped girls and women in Nepal so much in the last two years. Today we celebrate the enduring strength of women all around the world … and recommit ourselves to fighting even harder for girls’ education and women’s empowerment. On this International Women’s Day, we recognize the incredible value that women of all backgrounds add to every socio-economic system around the world — while receiving lower wages, experiencing greater inequities, discrimination, harassment, and economic insecurity.